Felicity Inkpen has brought her original drawings of various poisonous plants and flowers to Two’s Company Studios until the 28th of February. Prints are available to purchase to take home with you. Come in and peruse them! “#OVERPRINT! We’re running an exhibition with our mates @jacknifeprintsand @notnowstudio at @twoscompanystudios / @alexdoescoffee! The exhibition is a wide range of our collective test prints, off-prints, mistakes and experiments gone wrong! Pop in for a coffee and a chat and have a browse! I’ll be posting selected pieces from the exhibition for the next 2 weeks!” Check out @16tonne on Instagram for updates. Ending on the 17th February. Two's Company Studios brings you a weekend full of activities! Whether it's snooping around to check out the inner working of our studio spaces, getting involved in a creative workshop, sorting out all your Christmas shopping in our pop up shop, sampling some of Alex Does Coffee's excellent food/drink or watching an intimate gig/performance, we've got you covered. 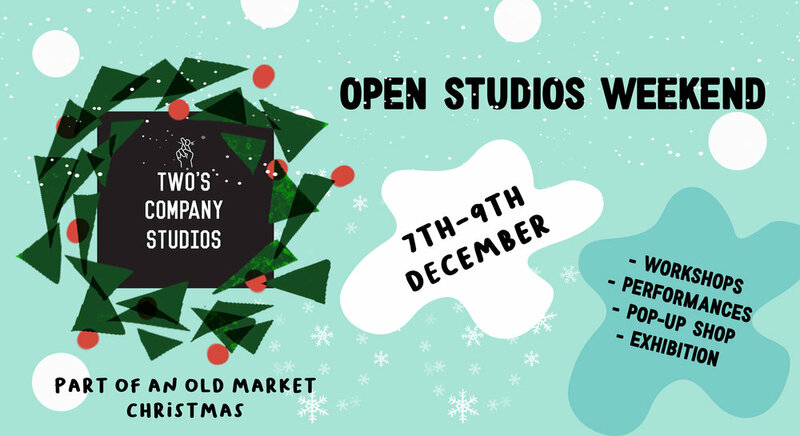 This weekend is to celebrate our studio holders and the amazing work they do, so come on down and get involved one way or another! Timetable of events to follow, make sure you're following this event for the first look of workshop sign-ups, gig tickets and other important information. Coming to deck out Alex Does Coffee in Two's Company Studios is The DIY Supermarket! 16th November until the 28th of December. A fresh new online marketplace full of independent brands, homeware, clothing, jewellery and everything in between, The DIY Supermarket is your one-stop shop for supporting independents. The exhibition and pop- up shop will showcase an edit of creatives from the site with limited edition pieces and a chance to see the online pieces in person, you'll be able to fall in love with your favourites and take them home. The next exhibition adorning the walls is brought to you by Bristol based artist Lizzie Stone, starting with a launch night on September the 28th and running Mon-Fri until the 28th of October. Lizzie Stone creates beautiful marriages of texture and colour, governed by the character of material and paint. Join us on the launch night from 7pm for some music and drinks to accompany Lizzie's stunning artwork. With original unseen pieces on show and limited edition prints you'll get to experience Lizzie's style old and new. All pieces are available to buy and we will be accepting cash and card throughout the exhibition. We can't wait to be surrounded by her pieces, make sure you come down and see them for yourself! Want to learn to screenprint? YEAH YOU DO. Not Now, Jacknife Prints + 16 Tonne Press are now booking places for their hand pulled, screen printing courses for September. Get in touch at info@jacknifeprints.com or info@16tonne.co.uk if you're interested. With festival season dawning on us what better time to immerse yourself in the new exhibition by Tom Stevens Art, Late Night Lazer Beams and Other Mischief. On the opening night we'll be treating you to a bar to wind down (or amp up) your Friday evening with and DJ's to soundtrack the evening. Join us in celebrating Tom's work and festival culture by having our own little party on Friday 15th June from 6pm. Tom will be showcasing a selection of artworks all derived from his festival sketchpads over the Summer months. He'll be showing newly printed risographs printed in-house by 16 Tonne Press, screen prints, digital prints and of course originals. Come and see his processes and the way he captures the essence of the party all in one image. This exhibition will be showcasing from June the 15th until July 20th in our space at Two's Company Studios with artwork available to buy for the duration. The space is in good company with Alex Does Coffee as a room mate, so come and have a peruse and maybe even a coffee whilst you do so. All artwork will be available to purchase from the Alex Does Coffee counter, just speak to the lovely Alex or Sam. Northern-based designer, illustrator, graffiti artist, former world record breaking ASBO holder and general surface botherer ‘Eject’ is taking over ‘Two's Company Studio's’ in association with J.A.P.P with an exhibition of Americana advertising nonsense, confusing consumerism and twisted thoughts, as he takes on his new identity as ‘The world’s north’s greatest worst salesman’. Influenced by Disney, Ren & Stimpy and Nickelodeon (to name a few), Eject’s work mixes bold typography with his love of graffiti, sign writing, retro packaging and a weird obsession for twisted saccharin characters with shady, ulterior motives. You can also see his graffiti murals, street pieces and various restaurant/bar interiors all over the UK and Europe – and some of his trademark demons are even keeping a beady eye on Tokyo’s neon streets. But save yourself the bother and the bus fair, and get yourself down for the opening night show. No mugs. Drinks Bar. Good times. The show is currently still running so please pop down and take a look, if you would like a private view please get in contact with us. Check the slideshow for the fresh stuff!